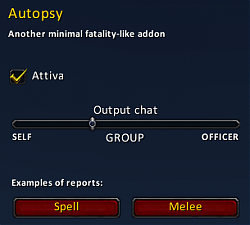 A very simple death report. It announces to a specified, user defined, channel how a player has died. All the configurations are done by a simple config panel. SELF: prints information only in player's chat. GROUP: try to guess and reports to the right [ party|raid|instance_chat ] channel. I want to really thanks Phanx and all the WoWI forum users for their suggestions and inputs on this. Great addon! You think you can add an option to see more than just the last attack that killed you tho ? Like last 3 attacks for instance ? that would be great! 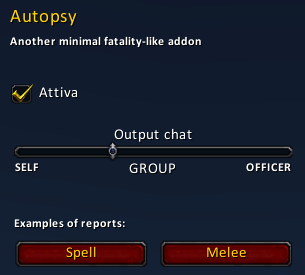 I thought about this thing when I wrote the addon, but at that time I was unable to achieve it easily. Last edited by gmarco : 10-18-13 at 11:45 AM.